This is the second revival of Fiona Shaw’s production of Figaro (first reviewed by Mark Berry on this site in 2011 here). 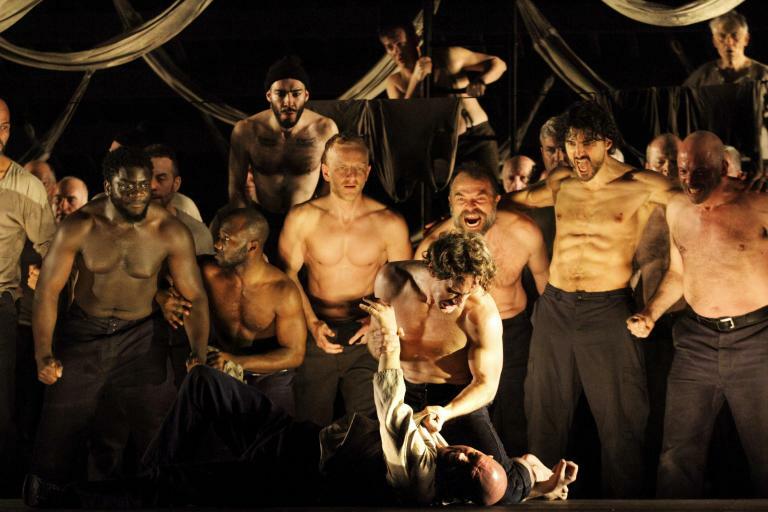 The new cast is an invigorating mix of the familiar and the new, with more than enough fresh blood to suggest English National Opera’s fine tradition of nurturing talent is alive and well. Martyn Brabbins conducts his first ENO revival as music director with the company. The revolving sets reflect a world in which everything is fluid, nothing is sure, not even who is who. That world is of course that of the characters of Figaro, but those dynamics could equally well be of the present day. Revolving sets are brilliantly negotiated by the performers. Projections of bull heads might simply imply the Count’s base sexual nature and his animalistic instincts. At one time he gets his belt out to punish Cherubino. they are often seen attached to human bodies though, implying a minotaur – is the Count trapped by his own nature? Is the onstage maze that of Theseus? The maze itself shifts persona, a house maze in Acts I and II, in Act III a room, in Act IV a low maze so one can see past it. Certainly, the plot can seem labyrinthine to the uninitiated, and this reflects the tangled strands of da Ponte’s libretto and Mozart’s ingenious setting. The one person who can bring consistency to this is the conductor. Martyn Brabbins’ tempi were occasionally on the slow side – the Act I duet, ‘Se a caso, Madama’ (in the original) – and there were some first night disagreements between pit and singers; as the opera progressed, though, things seemed to settle, tempi seeming more consistently placed and with more of a sense of direction over longer spans. The cast was almost exclusively British, with the exception being the Figaro, the Dutch baritone Thomas Oliemans. It had been Iain Paterson in 2011. Oliemans has taken parts such as Papageno Zauberflöte , Schaunard Bohème and Fritz Kothner Meistersinger at Dutch National Opera. This is a strong assumption of Figaro, robust and enthusiastic, with Oliemans enjoying every second of ‘Non più andrai’. His Susanna was Welsh ENO Harewood Artist Rhian Lois. Role-hopping, she recently sang Barbarina for WNO. She is an excellent Susanna, bright in her opening exchanges with Figaro, eloquent in her Act III duettino with the Countess, ‘Sull’aria’. Katie Coventry’s Cherubino was a triumph. A participant in the ENO Pirates in February 2017 (she took the role of Edith), her ‘Non so più’ was a thing of breathless beauty, her Act II ‘Voi che sapete’ poised and eloquent. Coventry seemed to fit the part perfectly. Given that the Pirates Edith was her professional debut, she seems to have a fine career ahead of her: a glance at her bio shows she will debut at the Teatro Real, Madrid shortly and she will spend the 2018/19 season at the Salzburg Landestheater. The Count and Countess are a fascinating couple. Bass-baritone Ashley Riches makes his role debut as the Count (he was the Pirate King in that ENO Pirates). Seen many times in Baroque roles (particularly Handel), he proves himself an adept at Mozart, his tall presence underlining the bullying aspect of this production’s portrayal of the Count. Opposite him is British soprano Lucy Crowe, who was a fabulous Pamina in the 2016 Magic Flute at the Coliseum. This was a faultless take on the Countess, her ‘Porgi amor’ shaped beautifully, her ‘Dove sono’ from the third act similarly touching. Doctor Bartolo is the wonderful Keel Watson. His role list is not that long, and one hopes to encounter him again, his stage presence is an absolute delight and his ‘La vendetta’ revealed a fully formed, burnished voice. Don Basilio is shown as partially sighted in this production; Colin Judson takes his part well. Bringing a wealth of experience to the cast was Janis Kelly, a member of ENO for over 30 years. (See also my review of the 2013 Satyagraha, in which Kelly took the role of Mrs. Naidoo; elsewhere, see also for example Kelly’s Glyndebourne Berta Barbiere at the Proms in 2016 and at The Royal Opera in 2014.) Kelly’s spinster Marcellina was perfectly assured and full of character. In this production, both gardener (Antonio, Paul Sheehan) and his daughter, Barbarina (the excellent Alison Rose, whose pin aria ‘L’ho perduta’ was a triumph) were drunk, although in Barbarina’s case it was presumably more the ongoing party’s fault than a lifelong habit. A simulating evening, for sure, and with such freshness of singing at work it can hardly fail to succeed.